Enrolling in an Adult karate class at The Karate Academy is a great way to build fitness and learn self-defense! 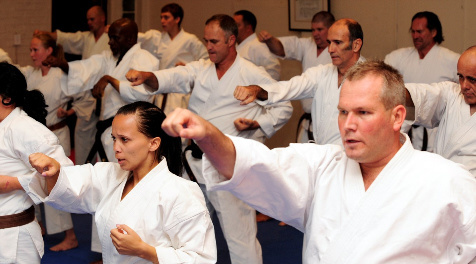 The Karate Academy offers classes specific for Adults. The pace and content of classes for Adults are very different from the pace and content of junior classes. Adults need more intense and goal-driven classes, and they have a better understanding of techniques and sequences. This allows The Academy to offer 3 gradings per year to Adults. The classes cover cardio training as well as self-defense training. The Academy offers an OPEN CLASS system which is very popular and allows parents to train at the same time as their children, but under separate instructors. The Karate Academy has 6 training venues in Pretoria for your convenience. Why not give it a try? Karate will give you all the benefits of exercise and more. No uniform is required for a trial period. Contact Us today!